First, you’re invited to check out my blog (the one listed as Latest Creations in my signature at the bottom of the page) during the month of November---I plan to post every day (excluding Sundays) in November for National Blog Posting Month. I’ll still have Recipe Monday as well as a daily project or card, and a “local customers only” BLOG CANDY GIVEAWAY. 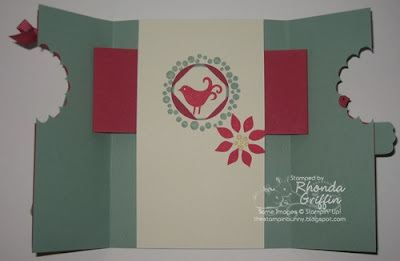 Second, you’re invited to give me or your friends and family a Stampin’ Up! Christmas Wish List. Orders need to be placed by DECEMBER 10th for Christmas delivery. Third, you’re invited to consider stamp club for spring! I’d love to have you come to Technique Class for FREE with your Stamp Club commitment order ($25/month for 6 full months), or if you’d rather have a separate workshop and invite your friends, we can do that of course. You’d earn hostess benefits during one of the months for a free level one stamp set plus $15 in free merchandise too. Just email or call if you have questions or are ready to sign-up. Fourth, you’re invited to my classes of course! On Wednesday, November 4th AND Thursday, November 5th at 6:30 p.m., I’ve scheduled my Sparkling Christmas Technique Class ($10). These are great cards for some of your most special card recipients! For $10 Technique classes, $5 of your class fee will be refunded with a $25 order (total before tax and shipping) and the full $10 will be refunded with a $50 order (merchandise total before tax and shipping). Gold Embossing, Cracked Glass, Emboss Re-Lift and the Marvelous Magical Marquee are great cards for your special friends at Christmas, and you’ll want to use these techniques again! 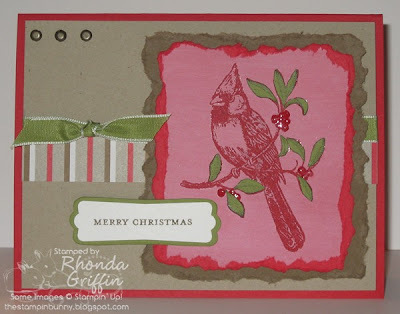 To see all four cards just click to visit my Events Blog here: http://thestampinbunnyprojects.blogspot.com/2009/10/sparkline-christmas-technique-class.html. On January 7th, 2010, at 6:30 p.m., I will teach Fun Faux Fabric Techniques ($10 for 4 projects)...including Faux Silk and Faux Linen. Thursday, January 14th at 7:00 p.m. - 1, 2, 3 Stamp! Thursday, February 4th at 6:30 p.m. - Valentine Technique Class ($10) We'll make some Love Potion (possibly #9 ;) ), a lip balm holder, and a card. 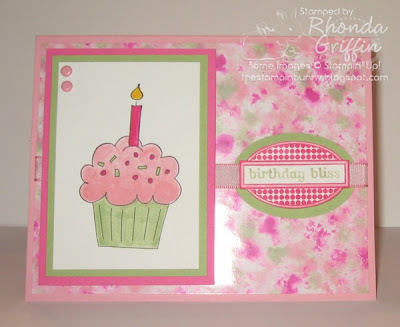 You’re also invited to visit my Stampin’ Up! website 24 hours a day for ordering (direct to you-you may also contact me for ordering of course) or to call and book a workshop or book party! Combine & allow flavors to meld overnight. Eat with King’s Hawaiian Bread. you’ll need to double the recipe. It is also yummy with carrots. My customers enjoyed this at last week's Christmas Project Buffet. Each Monday for 6 weeks, I will post my meal plan for the week. Then, I will post the remaining meals our family likes but just didn't eat during that time. 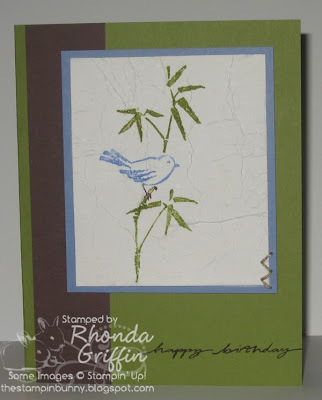 After that, Monday will be Recipe Monday on my blog with favorite actual recipes and stamping recipes. 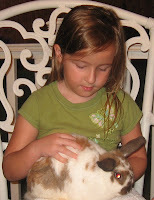 Hopefully, this will "spice up" the information you can find on my blog. I've had this idea since I saw Janine's tutorial and video on her blog here. I finally completed it and plan to offer it at my November Technique class. Let me know what you think. :) I will also offer it with just a single layer Kraft main layer for those who don't want to fiddle with the intricate layer matching....A choice is always good, right? I think Sage Shadow and Rose Red are unusual and yet still Christmas-y and the Very Vanilla and Kraft really soften the look. I used a different texture plate as you can see, made the tree slightly narrower, and didn't include the star. When you open the card...ta da! Isn't Janine's creation the greatest? What fun someone will have when they open this card! Sorry my Card Recipe is so late... I tried to finish earlier, but I am really slow lately! This week's Card Recipe is a new technique I discovered in my convention swaps. 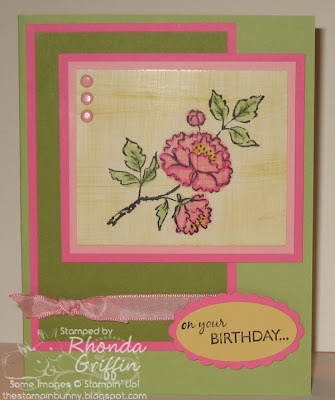 The first card shown is a very close CASE of this linked card on Stampin Addicts by Mary Beth West/mbstamper. She allowed SA/me to use her technique as the Technique Challenge this week (click here for challenge and instructions), and we named it Emboss Re-LIFT. 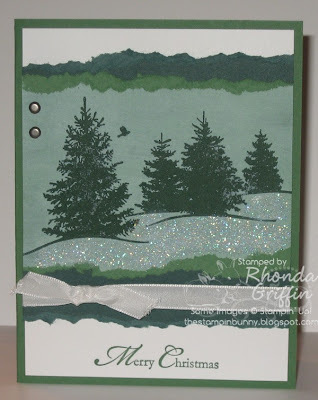 It is a lot of fun, so I think we will make this Scenic Season stamp set card at November Technique Class. (I frayed the taffeta ribbon ends on purpose...You may choose not to fray.) 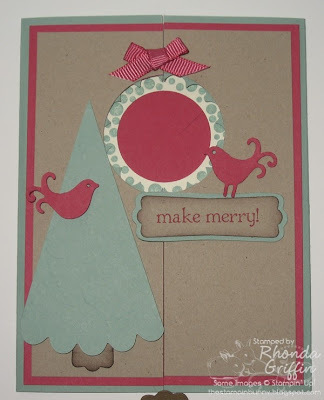 Thanks for sharing this great technique Mary Beth! So I mentioned that I enjoyed the technique, right? I also decided to do last week's Color Challenge on SA shown here. It was Old Olive, Kraft, Real Red and Soft Suede. The Emboss Re-Lift technique softened the Real Red, and provided a nice contrast to the paper pierced leaves and shiny berries completed with Crystal Effects. It is a fun change for the cardinal to be the incidental part of the image I think. I am so happy to have created a 6 week menu plan that I thought I'd share about it occasionally on my blog. I have a full 6 weeks worth of plans, but occasionally we do go out to eat even when it isn't scheduled (bad me! ), so in my 3rd week, we still haven't followed one of my original weeks exactly. 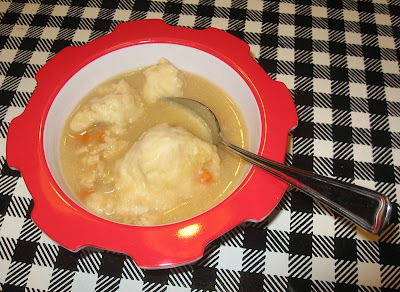 Maybe you already do this, but perhaps seeing my list will remind you of a favorite recipe you haven't had for a while? What does that have to do with stamping, you ask? Well, in the past I've spent time on the phone with my husband asking what sounds good (oh, you had Mexican for lunch-scratch that), I've had to change gears when I find that I don't have an ingredient I need for dinner, and I've often suggested we go out or have fast food when I just can't think of anything to make. Now, I post the plan and be sure I have every ingredient 2 weeks in advance. All the previously wasted time can now be spent.....Stamping, of course! Friday: Grilled Teriyaki steak and veggie kabobs (Zucchini-1-inch chunks, Onion-large pieces, Orange green pepper, pineapple-not in the marinade) I use Soy Vay brand Island Teriyaki bottled marinade and add 1/4 cup or so of Brown Sugar and some pineapple juice and marinate overnight. Sunday: Ritz Cracker Chicken-bone in chicken dipped in melted butter substitute (with black pepper) and covered in smashed Ritz Crackers. 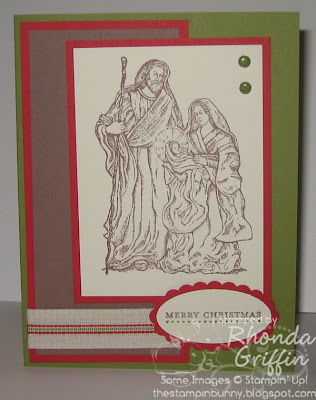 I think this may be my favorite of all the Holy Family Stamp Set cards I've made, and since I love this set, I've made several :). It is simple, but I really like this ribbon with it. 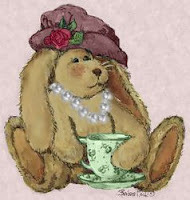 It is one of four cards available during my "choose your date" Stamp A Stack on the 22nd, 23rd or 24th of October.